Description: Polished silver.100mm spacing;32 hole.A modern take on the classic six window high flange hub. 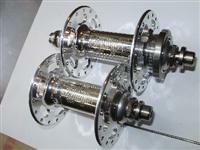 The High Flange Front hub builds up very stiff wheels and has heavy-duty steel axle bolts. This hub is about as bomb-proof as they get.